She talks for a full 7 minutes! She recites 15 full-length nursery rhymes when her arms are in "reading position"
She was sold only from 1967-1969. Randi is designed so that her eyes only move back and forth when she is holding her book - or basically when her arms are held up at "eye level". The rest of the time, when her arms are in other positions, she says one of 15 phrases with appropriate pauses in between to allow a child to answer. Looks like she was sold in '67 and '68. The book she holds is made of yellow plastic and then there is also a companion book for the little girl to read with her. It has a picture of Randi Reader on the front and has the nursery rhymes that she reads on the inside. How much she may have cost when first marketed. We were optimistic that Randi would work when we got her once we cleaned all the battery contacts. Unfortunately, she did not work. 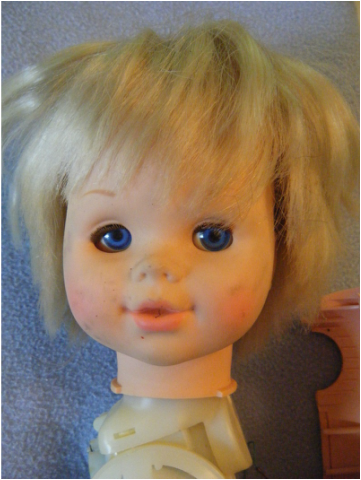 This doll was not meant to be disassembled. To get to her mechanism the hard plastic body had to be cracked. This was accomplished by using razor blades and dremel tool to split the seam. The dremel tool had to be used sparingly because the cut would fuse back together at even the slowest settings. Once the exposed seams were cut the thicker areas around the arm holes, leg holes, and neck had to be wedged and cracked apart using a screwdriver blade. I need a picture of the right side because that is where the control wire resides - the mechanism is visible. Figure 1 - Randi Reader is pretty dirty. The grime on her face and the ink mark in her mouth cleaned up well. Her eyes shift left to right when she is in reading mode (arms up). Figure 2 - The left side of the phonograph system. The tiny gear visible near the top is what drives the eye movement in the head. The region at the bottom is where the phonograph record resides. It is not accessible. 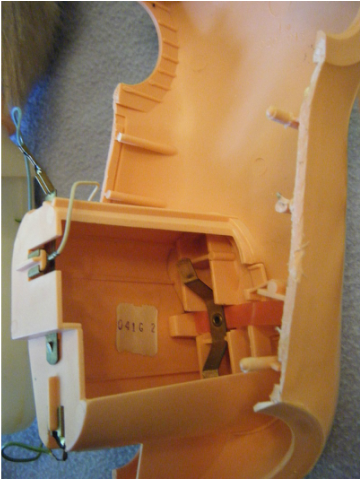 Figure 4 - the battery compartment takes two D size batteries. 3 wires exit the compartment. 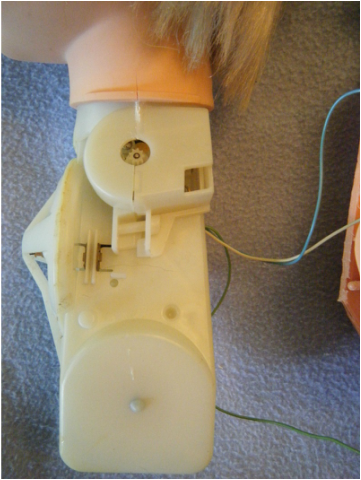 Pressing the button on the back of the doll pushes the topmost battery downward forcing its long springy contact to touch another stationary contact. 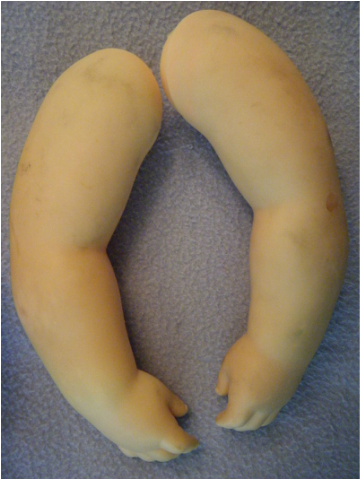 Figure 5 - the arms. 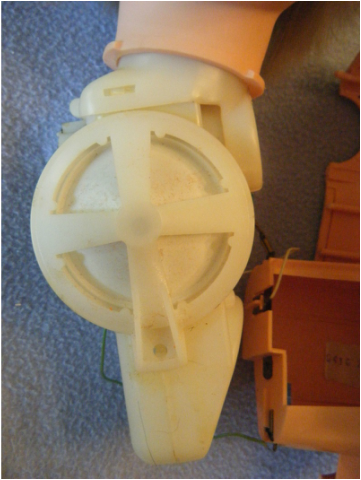 What at first appears to be faulty molding on the flange of the left arm is actually a critical feature of the speaking mechanism. When the arm is raised the extended flange engages with an exposed part of the phonograph mechanism - altering what Randi says. Figure 7 - There is nothing unusual about Randi's legs. 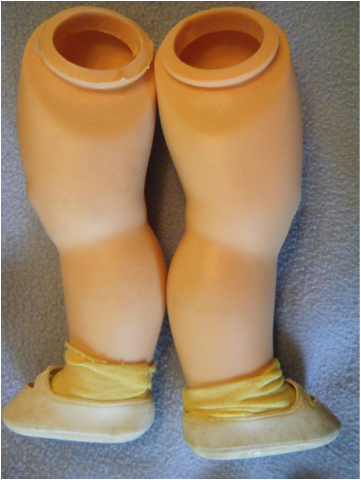 It was interesting to discover that this particular doll had a disc shaped piece of plastic lodged inside her leg - a remnant of the manufacturing process.